Just an idea (i haven't tried it yet). Use a 12x2mm aluminum pipe. Mill it to 8.8mm and cut a UNEF 3/8x32 thread. Then you can screw it onto a "F jack to plug" adapter. Straight or angled. Only the outer part of the coax connector is used as antenna. I was doing this with UHF connectors before I switched to plate antennas. The UHF chassis jack has a 4 hole plate for secure attachment, there are elbows, and the serrated prongs securely lock the orientation. 3/8" PEX tubing with aluminum tape on the outside, then covered heatshrink tubing, gives a nice "rubber duckie" type design. I used the internal connector to keep ESD exposure to a minimum when handling the antenna, and left the outer connector floating. The F connectors are good cheap connectors with frequency range over 2 GHz, which imply it is more than enough for coupling a theremin's antenna. The UHF connectors have also an extended frequency range, they are more expensive but have a more secure fixation. 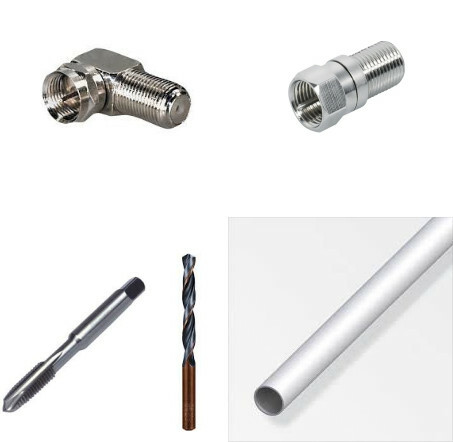 I would use F connectors for a coaxial cable, they are made for that, but for direct plugin of a metallic antenna, I would use UHF connectors. BNC connectors are good for coaxial cables too. When I saw the suggestion of using RF connectors that were rated for high frequencies for theremin antennas I was afraid they might be misused, and I thought it would be worth clarifying why the frequency rating is irrelevant. Any of the mentioned connectors can be used as a means of mechanically mounting theremin antennas, but they are not to be used as coaxial connectors in that application unless you are intentionally trying to place a shunt capacitance directly in parallel with your antenna (probably not). You can use them as single conductors with the inner and outer conductors shorted together, or you can use the outer threaded conductor only or the inner only with the other one left unconnected. When you mention that a particular connector is usable to some maximum frequency rating, that refers to when it is used as a coaxial connector in a 75- or 50-ohm impedance system. A typical F connector might represent 1.5 to 3pf of capacitance between the inner and outer conductors, so you don't want to have the outer conductor grounded. And if it isn't grounded, the connector has no frequency rating-it's just a conductor. So anything that conducts, is convenient to use, and isn't too bulky will work for mounting detachable antennas - plumbing fittings, bolts, banana plugs, aircraft fittings, or very expensive 26.5 GHz coaxial connectors. But any of these must be used as single conductors, and as such they have no practical frequency limit and will all perform equally in this application.